Foreign languages and General studies are not considered for the selection. The prizes are presented to the applicants in the Award Ceremony. Winners will automatically be considered for mentoring opportunities. By accepting the Award, winners are agreeing to take part in activities designed by the Mentoring team. Should be in their final year and expecting their grades the same year as they register. 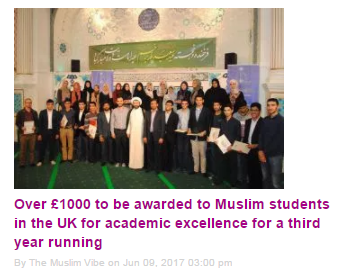 AS grades are not considered for the Award. In the cases of a draw, UCAS points system will be employed to distinguish the top 3 winners in each category. Any applicants who achieves the minimum requirements stated on the website will be presented with a Certificate in the Award Ceremony. The selection criteria can be changed if deemed necessary by the management team.